An all-time eat on the go snack, Black Bean and Corn Salsa is both healthy and hearty! It has the goodness of black beans along with corn, red onion, red pepper, diced tomato, olive oil and more. This salsa recipe is great to serve with tortilla chips. So, here’s how to make a large bowl of this homemade tasty, super easy corn and black bean salsa recipe under 30 minutes. I have a thing for dishes that are very quick to make. Because, be it for breakfast, supper or just chill home parties, such recipes act as a messiah. And while we are it what better than Muttabal, Mango Sriracha Cream Cheese Dip or for that matter even Black Bean and Corn Salsa Recipe. Usually, we are attuned to the thought of making Fresh Tomato Salsa as it is the most loved Mexican dip to pair with chips or Nachos. However, this homemade Black Bean Salsa Dip is also a great variation of salsa. Yes, one that surely deserves a try. The most important ingredient of this dip is the black beans that are drained and rinsed. But, tropical staples mango, avocado, pineapple and corn are also added to it for the better flavours. What are the benefits of eating black beans? Black beans are great for the heart health. They contain a good amount of fiber, vitamin B6, potassium. Moreover, they also decrease the amount of cholesterol in our body, leading to reduce risk for heart ailments. Essentially, I must say that black beans are more wholesome and filling. Therefore, even a small portion of Black Bean Salsa satiates you in no time. So, your diet stays in check, ladies! Plus, you just need to mix up ingredients in a bowl to make it. No extra drama! Talking about the taste of this dip – it is amazing. It has just the right spice, tang and zing to turn even your dullest day into something exciting. Hence, do have a quick look at the recipe to make Black Bean Salsa and tell me how it turned out, okay? 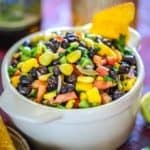 How to make Black Bean and Corn Salsa? To make this salsa you can use either fresh corn or frozen ones. I like to use fresh kernels as they are easily available in India. Just boil the kernels until they are soft and good to eat. You can also boil the kernels in some broth to enhance the flavour. If fresh corn is not available or you are short on time, use drained and rinsed canned corn kernels to make this salsa. I used canned black beans to make this salsa. Make sure to rinse them well before adding. You can also cook black beans at home is you with to using my Instant Pot Black Beans recipe. Since mangoes were in season, I added a few. They go very well in this salsa. You can also try adding kiwi, pineapple, persimmons etc. Bell Peppers gives a nice crunch and I highly recommend adding them. 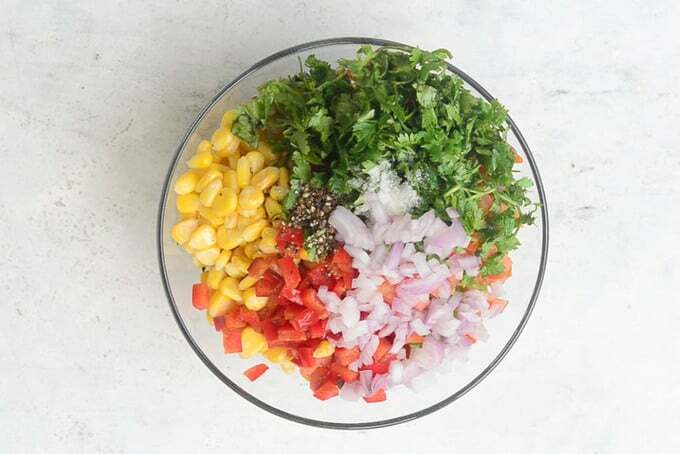 Now make a simple dressing using lemon juice, salt and pepper and add it in the salsa. You can also make an Italian dressing for this salsa too. 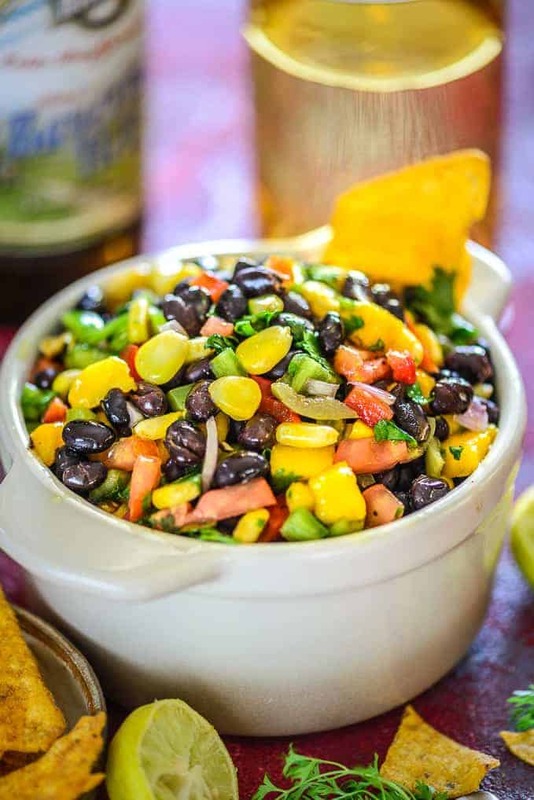 Black Bean and Corn salsa with Italian Dressing – Make an Italian dressing with EVOO, red wine vinegar, honey, lemon juice, dried mixed herbs, salt and pepper and pour it over the salsa. You can also add some grated parmesan cheese to the salsa. With Balsamic Vinegar – Try replacing half of the lemon juice with Balsamic Vinegar. It gives a very earthy taste to the salsa. Black Bean and Corn Salsa with Avocado – Avocado pairs very well with the beans and corn and makes for a great addition in this salsa. So if you have a good ripe avocado, do try adding it in this recipe. Sweet Black Bean and Corn Salsa – Make sweet and tangy version of this salsa by adding 2 tbsp sugar in the it. Trust me you will love the taste. Black Bean Corn Salsa with Rotel – Swipe the chopped tomatoes with drained 1 can (10 oz each) of Ro*Tel® Original Diced Tomatoes & Green Chilies. It gives a very different taste to the salsa. An all-time eat on the go snack, Black Bean and Corn Salsa is both healthy and hearty! It has the goodness of black beans along with corn, red onion, red pepper, diced tomato, olive oil and more. 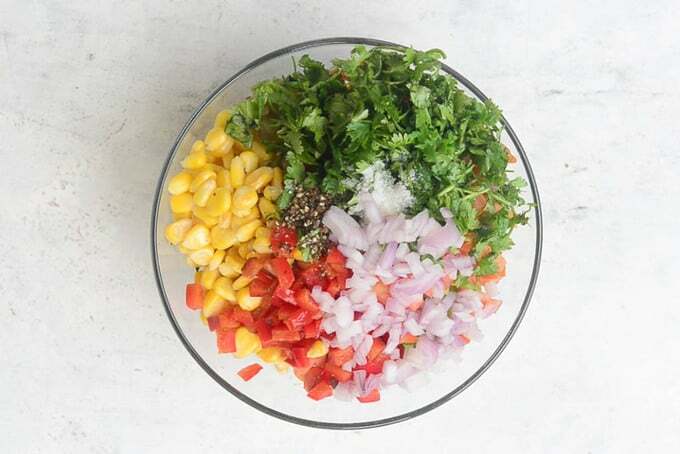 Add all the ingredients in bowl and mix well. Cover the bowl and refrigerate the salsa for 30 minutes. Serve with nachos or chips.